As I considered the position of being a season ticket holder for a California-based team and stared at the potential of playing the same four teams over and over again, it occurred to me that some teams are better than others in terms of schedule diversity. Schedule diversity is just what it sounds like. How many teams do you play and how many times? In the AHL, one might argue that playing every team in the league isn't necessary or even advisable in order to attract casual fans. However, if you play the same four teams practically every game, that also gets a little bit blasé. So what to do? If you know me, you know I'm all about data and counting what is countable. In this case, I made an algorithm to quantify schedule diversity. In order to do this, I had to identify the most important factors to diversity and then I had to weight them based on how important they are to overall diversity. This one is pretty straight-forward. How many teams did you play in your own conference? There is no reason why this shouldn't be max score of 14 for every team in the league. Surprisingly, this does not follow for all teams. Cross division play, especially out West, is no guarantee, and it is surprising which team scores lowest in this category. Because of how important this is, it makes up 60% of the score. I have honestly gone back and forth on this one in the past six years. At this point, I'm in a take what you can get state for Texas, at least. However, as was the case last year, if you are Syracuse and you don't play Utica, which you literally drive past to play Albany many times per year, that should count against you. With the Eastern teams more well defined and the difficulty of determining a geographical element to the equation rather high, I opted to exclude that little tidbit. The OOC score is 10% of the final score. If you don't play any out of conference teams, you get a zero. If you play just one, you get 8.6%. Each additional team after that is another 0.1%. I feel that's a pretty realistic way to look at things, given how little interconference play there is overall. Things got a little screwy on the last metric, but stick with me. We want to add some sort of factor that penalizes teams that play the same four opponents 48 times in the season. Basically, what good is it to play all 14 teams in the conference if you play 10 of them 20 times and the other four the rest of the season? To do this, I started with the "Idealized Team Diversity" score. This is easy. It's the number of games you play divided by your number of opponents. We round this up to the nearest even number (because you can't play odd games in the AHL) Texas has 76 games and 14 opponents this year, so their ITD is six. Now we count the number of teams that the team plays six or fewer times and divide that by the total number of teams they play. This gives us a measure of how many teams they play a reasonable number of times and how many they might be over-scheduling due to rivalries or geography. I gave this a 30% weight, because we've all been to too many Texas Stars v. San Antonio Rampage games. Huzzah for the Amerks, who are going to play all 14 teams in their conference and tack on two out of conference teams for good measure. They top the rankings with a 0.893 rating. San Antonio and Texas are just behind them, and I swear not by design. Things just work out that both teams play everyone in their conference and have a good mix of those teams. Being centrally located is clearly good for Hershey, WBS and Lehigh Valley out east. Those PA teams are near the top of the rankings because they hit all the teams in their conference and have a good spread among them. What are you doing, Chicago? They aren't playing a single California team and they have only 9 teams on their schedule overall. That's the same as four of the five California teams. Ontario is the only team in the league playing fewer games than Chicago at eight. Predictably, the Reign do have the worst diversity. 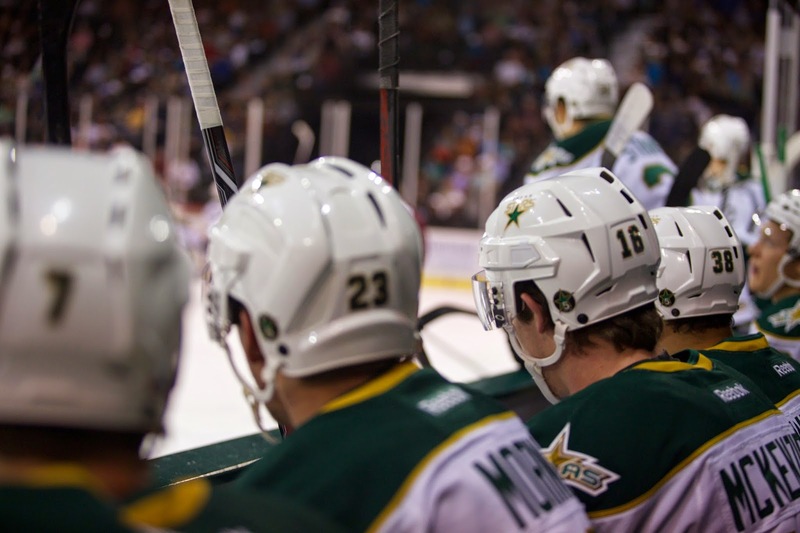 Clear your calendar; the Texas Stars finally have a schedule for 2015-16. After much waiting, as always in the AHL, the league has released its slate of contests for the coming year. You can view it on TheAHL.com. As if you were going to expect anyone but the Rampage as the most frequent opponent... With the arrival of the California Five, however, Texas tacks on two more games than they've ever played against a single opponent. The previous high of 12 was set against OKC, San Antonio and Houston in various years in the past. The year San Antonio and Texas will play 14 games. Only three other teams have 14-game matchups on their calendar: Providence, Portland and Springfield. The Bruins will, in fact, play either Portland or Springfield for 28/76 games this season (almost 2 in 5 games). So that won't get chippy or boring or anything, I'm sure. Rockford, who ended last year's Calder Cup pursuit, returns to the CPC on December 2nd. Two day games will dot the schedule, both away, on November 17 and December 17. Maxime Fortunus does not return to the CPC until March 2nd. The Dallas Stars have released the schedule for training camp, which will take place in Cedar Park this September from the 18th-22nd. All sessions will be open to the public. Get excited, people. The Dallas Stars and Cedar Park Center have announced details for the team's 2015-16 training camp including open practice sessions, the Stars Party at the Domain and the Victory Green vs. White Intrasquad Scrimmage. The Dallas Stars will bring their NHL training camp to Cedar Park Center from Friday, Sept. 18 through Tuesday, Sept. 22. The practices on Friday, Saturday, Monday and Tuesday are all open to the public. Fans wishing to attend the sessions can enter through the east entrance of Cedar Park Center. On Sunday, Sept. 20, the Stars will host the Victory Green vs. White Intrasquad Scrimmage at Cedar Park Center. 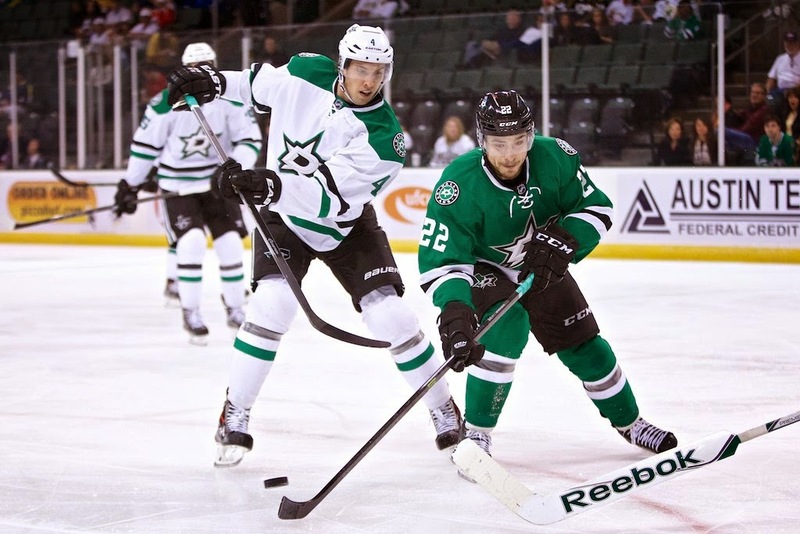 Split into two teams, the Stars will play an officiated scrimmage beginning at 1 p.m. All Dallas Stars and Texas Stars ticket package holders will receive a complimentary ticket to the game. Tickets are on sale now to the general public by visiting the Cedar Park Center box office, calling Ticketmaster at (800) 745-3000 or visiting http://www.ticketmaster.com. Friday evening, fans can attend the Stars Party at the Domain beginning at 5 p.m. Free and open to the public, Stars Party at the Domain will feature live music from the band Radiostar from 6-6:45 p.m. and again from 8-8:45 p.m. In between the music sets, the Dallas Stars will take the stage for a question and answer session scheduled to include several members of the organization. In addition, the Dallas Stars Ice Girls, Street Squad and Victor E. Green will be on hand throughout the event. Times for the on-ice sessions are subject to change. Muse stymies Curtis McKenzie in a March 12, 2014 game between Charlotte and Texas. The Texas Stars have announced this morning that they have filled two more roles on the 2015-16 squad. Most importantly, Texas has their backup goalie, John Muse. After many others were taken in the first few hours of free agency back on July 1, it looked like John Muse was the top candidate to fill the job behind Jack Campbell. It looks like the Stars got their man a month later. 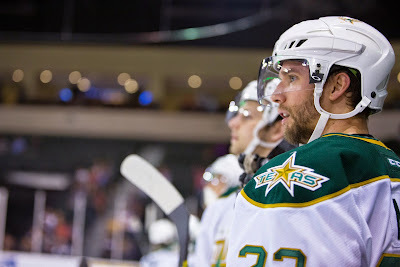 With many other options off the table, John Muse remains as my top candidate to take the #txstars backup spot behind Jack Campbell. Muse has always been solid against the Stars and has quietly set a few records with the Checkers over the past few years, earning their season win record and franchise career win record. He is playoff proven in the ECHL and is just a solid pro all around. He can take the starting reins if you need him to, but if not, he is a great backup too. It's an excellent signing by Texas. The second signing is defenseman Brennan Evans. Most familiar to Stars fans from his time with the Peoria Rivermen, Evans is also a long-time AHLer. With 12 years in the American League under his belt, this is your big veteran presence that was missing until today. 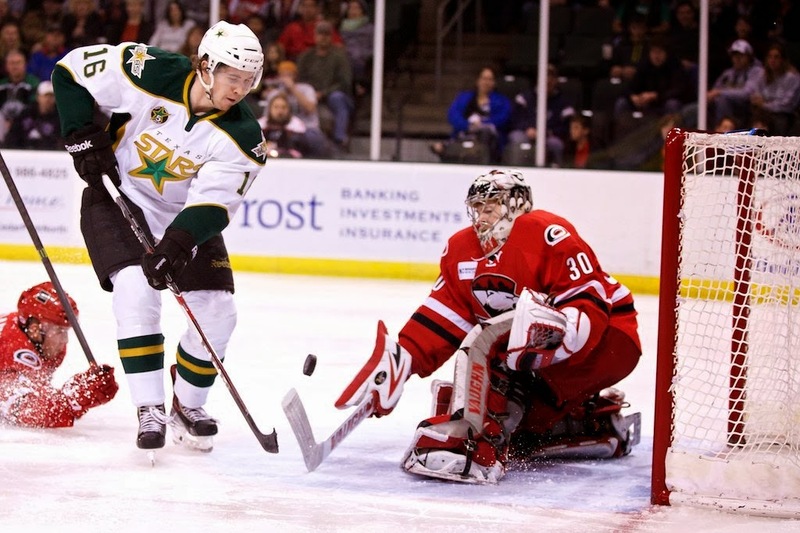 After losing Fortunus, Gaunce and Meech, Evans will make a big difference in getting that veteran experience to work with the younger kids on D.
The Texas Stars, American Hockey League affiliate of the NHL's Dallas Stars, announced today the team has signed defenseman Brennan Evans and goaltender John Muse to AHL contracts for the 2015-16 season. Evans, 33, brings a veteran presence to the Stars' blue line with 834 career AHL games on his resume and a 2013 Calder Cup Championship with the Grand Rapids Griffins. The 6-foot-4, 225-pound native of North Battleford, Saskatchewan adds physicality to the Texas lineup with 1,679 penalty minutes in a 12-year AHL career between seven teams (Grand Rapids, Peoria Rivermen, Toronto Marlies, Iowa Chops, Worcester Sharks, Binghamton Senators and Lowell Lock Monsters). Evans appeared in two NHL playoff games for the Calgary Flames in 2003-04, and scored the game-winning goal in 2013 that clinched the Calder Cup Championship for Grand Rapids in Game 6 against the Syracuse Crunch. Muse, 27, is an experienced goaltender entering his sixth AHL season. The East Falmouth, Mass., native spent the past four years with the AHL's Charlotte Checkers. Muse (MEWZ) has appeared in 108 games in his AHL career with a 2.65 goals against average and .926 save percentage. Prior to turning pro, Muse competed for four years at Boston College and won the NCAA's Frozen Four National Championship twice (2008, 2010). The 5-foot-11, 185-pound goaltender also won a Kelly Cup Championship with the ECHL's Florida Everblades in 2012 and was named the Kelly Cup MVP. His 27 wins in 2013-14 and 54 career wins are both franchise records for the Checkers.